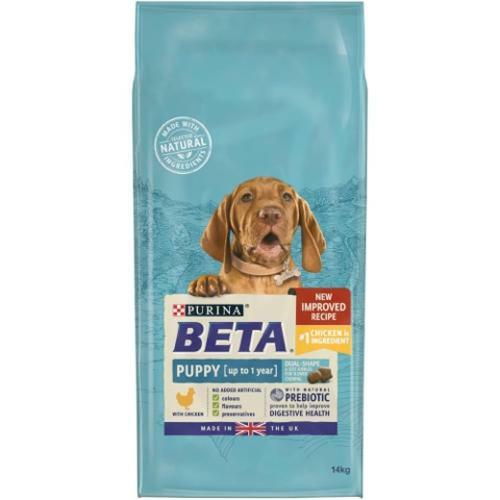 BETA Chicken Puppy Food is sure to keep tails wagging! Sniffing, chasing, and exploring - everything is new for your puppy and growing up is hard work! That's why our PURINA BETA tailored nutrition for puppies includes antioxidants to help support natural defences, and DHA that's essential for growing puppies. It is also specially formulated with selected natural ingredients and a natural prebiotic to help support digestive health, to help make sure your puppy is ready to explore the world every day. And we do all this without including any added artificial colours, flavours or preservatives. Feeding instruction: Feed puppies under 3 months of age 3 to 4 daily feedings of moistened food. After 3 months of age, gradually reduce moistening and feed 3 times per day. From 6 to 12 months, provide 2 daily feedings. Each puppy is different, depending on his activity level and body condition, food amount may need to be adjusted. For more details please check the brand website. Feeding during gestation and lactation: During the last 3 to 4 weeks of pregnancy and while nursing, food allowances should be increased 1.5 to 2 fold maintenance levels. After weaning, the mother's food should be adjusted to maintain her at an ideal body condition. Clean, fresh water should be available at all times. To monitor your dog's health, consult a veterinary surgeon regularly. Introduce PURINA BETA gradually over 7 days.